I decided to go green. In fact, I have already. Green, the nature loved shade and green is also said as "green, green, greedy pig. Haha! What a punchy waking up intro, wouldn't you agree? Let's forget about greediness, but we will still hail nature being green and instead of fish for other styles (Chilli Soy Fish, Grilled Sambal Stuffed Fish, Stingray Spicy Sauce & Tuna Cutlets), its a Thai style Green Fish Curry. Thai? Of course. Thais are the best people for producing green curries.They know it all. They have been doing it for years and Thai cuisine is much loved throughout the world for their big, bold and lighting up a food glow on your tongue, mouth, throat and tummy. 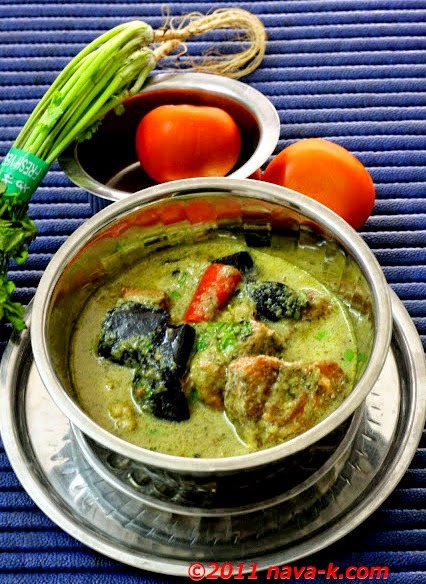 How do we make this Thai Green Fish Curry. We will make the green curry paste and though generally fish is tipped into the later made green curry (Asam Fish Curry, Indian Chicken Curry, Bengali Yogurt Fish Curry, Fish Sambar & Kerala Fish Curry), I fried the fish pieces alongside the ingredients listed under "for the fish" (Tuna Cutlet & Hong Kong Style Steamed Fish). While fish is being fried, we shall get down to making the curry and once done, fish is tipped inside. Tickling appetizing creamy, spicy and aromatic green curry, soaking up crispy on the outside and tender melt inside fried fish . Bye guys. Got to go. Time is biting into my schedule. See you next time. *** Marinate fish with these ingredients and keep aside. When oil is heated, deep fry brinjal, remove and keep aside. Do the same to the fish (deep fry). Add fenugreek seeds and curry paste. Stir and cook until aromatic and oil splits. Add tomatoes and stir in. .
Pour in milk, stir and simmer until curry is heated through. Add fish, fried brinjals, chillies and lime juice. Stir and simmer for another 2 to 3 minutes. . I love few things more than fish curry, and this mackerel version one sounds particularly wonderful. Thank you for sharing! I have yet to eat fish curry, but your recipe & picture does inspire. As the weather gets colder, I will be making more spicy choices for dinner and this look like a great one to start with. Delicious. If Spanish mackerel isn't available, what would you suggest for a substitute? 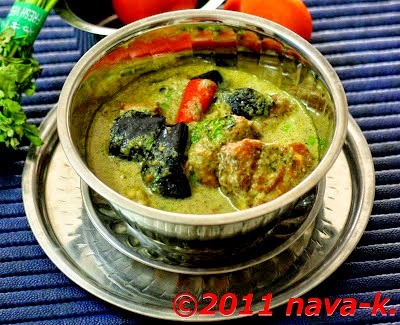 My mouth watering now,,,you tempting me with this green fish curry,looks deliciousserve with hot jasmine rice,,YuMMy..
Nava - this looks amazing! Your photos are terrific! I have seen green curry paste on market shelves here, too. If I can find green curry leaves, I think I'd rather make my own, too! Thanks everyone for all the comments. As for the fish, it can be replaced with any firm white colored one. I love Thai green curry paste! Looks delicious! Lovely Recipe!I'm definitely going to make this one,never made fish curry like this before and it has all my favorite flavors Nava!